Lately we have received many emails by our readers on how to fix the dreaded HTTPS Insecure Connection warning when serving ads at their blogspot.com blog pages. Unfortunately HTTPS is not supported for custom domain Blogger blogs (officially yet). These issue is mainly coming from users who are using blogspot.com blogs without enabling HTTPS Redirects at their dashboard. Update: As of March 2018, Nuffnang served ads/contents continues to display Mix Content warnings for HTTPS blogs/websites. We have seen Blog advertising community like Nuffnang (Malaysia, Singapore, Philipines etc) is serving their ads assets on an insecure protocol which makes your blogspot.com blog pages displays this dreaded "Insecure Website" warning -- very un-welcoming for your blog 1st time readers/visitors! This tutorial & information can be applied to other Blog-ing Advertising Community or advertising service provider if -- however -- they do not support HTTPS when deploying their ads/assets. The fundamentals & procedure would be similar if it involves adding unique codes/ID provided by the service provider at your Blogger theme codes or widgets. 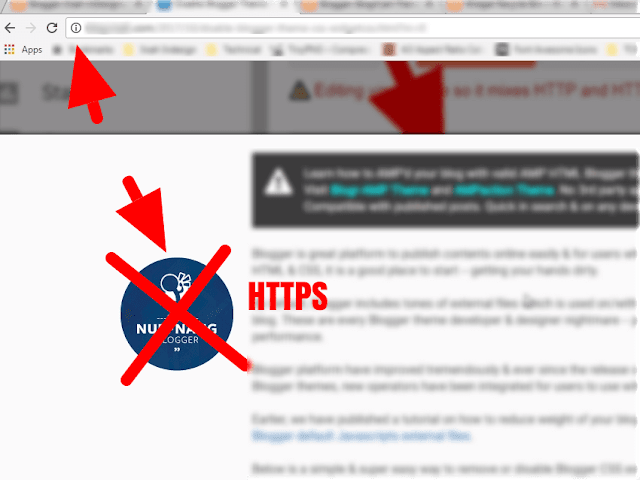 Until Nuffnang provides (full) support serving ads/assets over HTTPS, you can temporary remove your Nuffnang Ads codes. Note: Removing your unique Nuffnang ads codes in your blogspot.com blogs will loose/reduce/stagnant your Nuffnang earnings. In your Theme > Edit HTML codes. If you manage to find them, then remove the codes entirely -- your blog will not display ads by Nuffnang anymore. Once Nuffnang have officially supports HTTPS for their ads/assets, then you can re-add your unique ads codes in your blog Layout or inside your Theme > Edit HTML codes. The unique Nuffnang ads codes can be obtained in your Nuffnang Dashboard > Ads/Blog panel. Identify the HTML/Javscript widgets used in your blog layout where these Nuffnang ads isplaced. This will be used to reference the location at your Theme codes. Using this method, you need to set your blog HTTPS Redirects to "No", which will allow your blog pages be viewed in both HTTP and HTTPS versions -- getting the best in both worlds ;). Refresh your blog pages & preview both HTTP & HTTPS version of your blog pages to see the changes. By now Nuffnang ads will only display on your HTTP version of your blog & not displayed on your HTTPS version of your blog pages. Hopefully the dreaded "Insecure Website" web browser warning will disappear. If your blog still having these issues when viewing on HTTPS, than shout-out to us by using the comment form below. What does the Blogger Conditional Tags Do? If you find any issues or trouble implementing this, shout out via the comment form below or contact us -- our support help desk will surely help out.